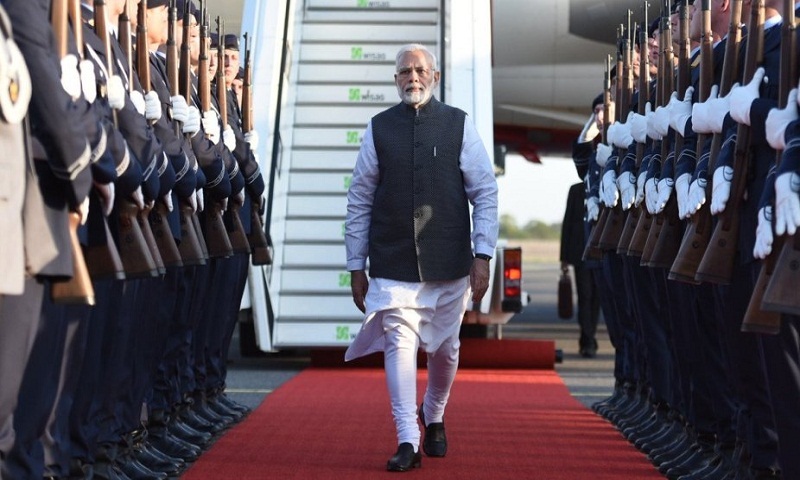 Prime Minister Narendra Modi arrived in New Delhi on Saturday morning after completing his three-nation Europe tour for which he left on Monday, 16 April. He was received at the airport by External Affairs Minister Sushma Swaraj. The PM arrived in Delhi from Berlin, the third and last stop of his tour, where he met German Chancellor Angela Merkel. In Berlin, PM Modi held talks with Merkel over a wide range of issues with an aim to further strengthen ties between India and Germany. The special focus was on strategic partnership. “Further cementing a cherished friendship! PM @narendramodi warmly welcomed by German Chancellor Angela Merkel at the Chancellery ahead of the bilateral meeting,” tweeted Raveesh Kumar, the spokesperson of the Ministry of External Affairs. He said that the visit maintains “the momentum of regular high-level dialogue” adding that the visit “demonstrates our mutual desire to strengthen our strategic partnership”. Modi’s meeting with Merkel follows the visit of German President Frank-Walter Steinmeier to India last month, which focused on boosting economic and strategic ties between the two countries. Germany is India’s largest trade partner in the European Union. The PM made the Berlin stopover after attending the Commonwealth Heads of Government Meeting (CHOGM) in United Kingdom, where he held a series of bilateral meetings on the sidelines. In the UK, Modi held an interactive session with the Indian diaspora called ‘Bharat Ki Baat, Sabke Saath’ at the historic Central Hall Westminster. The interaction, which lasted for more than two hours, saw Modi highlighting achievements of his government in the past about four years to build electoral momentum for the 2019 Lok Sabha polls. He also used the platform to target the Opposition back home and issue a warning to Pakistan. Before UK, the PM visited Sweden becoming the first Indian Prime Minister to visit the Nordic country in 30 years. At Sweden, PM Modi also held meetings with heads of state or government of other Nordic countries at the sidelines of the India-Nordic Summit. Before the one-to-one meetings with the Nordic leaders, PM Modi interacted with Swedish CEOs at the City Hall in Stockholm. At City Hall, the PM exhorted the business leaders to participate in India’s flagship initiatives and the Make in India campaign.